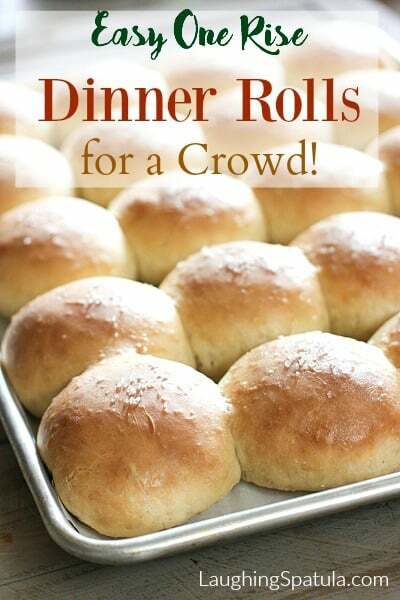 Homemade Rolls for a Crowd! – The most amazing rolls, made in the most amazing way! They rise in the oven then crank the heat to bake! crowd with only one rise! Three steps. No dissolving yeast or even a first rise. Crazy good too! Step One: Make your dough. I use a dough hook and my Kitchen Aid but your hands will work just fine for this. It’s a simple dump and mix technique…is that even a technique? Step Two: Once your dough is mixed, you shape your rolls. No need to let rise before shaping. Straight from the bowl to the sheet pan! I use a 16 x 11 or bakers half sheet pan. 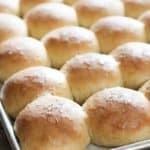 A 3.5 ounce roll will yield 20 dinner rolls. A 3.0 ounce will yield 24. 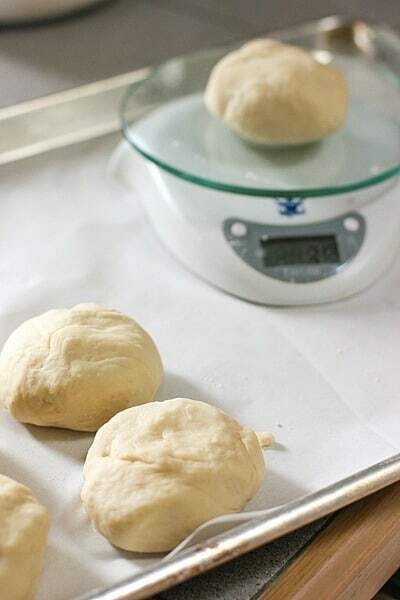 If you don’t have a scale, just eyeball it or cut your dough into 20 or 24 equal pieces. Don’t stress over this step, but the closer they are in size the more even they will rise and bake. Step Three: Preheat your oven to 170 degrees. Put your buns in the oven..yuck yuck….and let them rise for 30 minutes. They should look like below. Almost doubled. Let them go an additional 10 minutes if you think they need a bit more rise. Now here is the amazing part. Leave your buns in the oven! Turn the heat up to 350 degrees. I know! Crazy huh? They continue to rise while the oven is preheating. Bake for about 30-40 minutes. Brush with butter, sprinkle with a little course salt or sesame seeds and you got fresh, hot buns for a crowd! I have made these dozens of times, and in fact I posted them several years ago. You can see that recipe and the positive feed back here! (that recipe yields about 12 rolls, so if you are looking for a smaller batch, thats a perfect recipe! ). I like to bake these right when my guests arrive so the whole house smells like fresh bread! 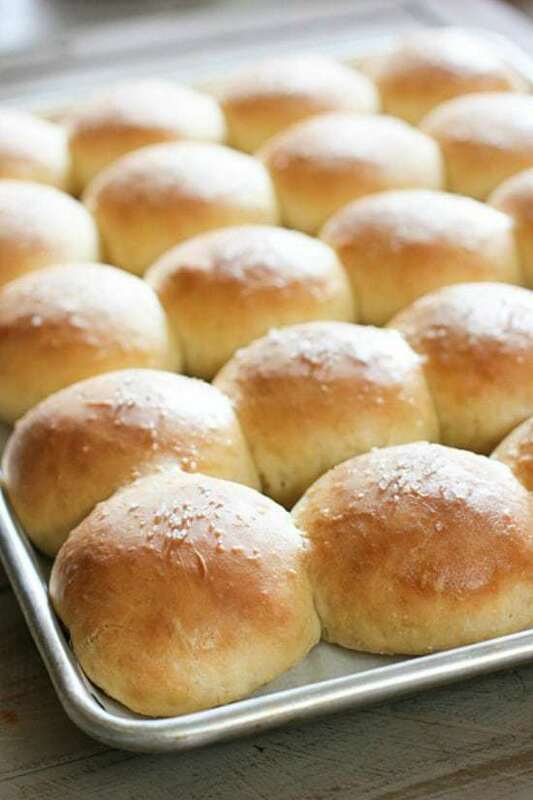 Ahhhh, nothing like fresh homemade rolls! Your family is soooo gonna love you for this! Make these the same day you serve them for best results! Serve with honey butter. One cube softened butter mixed with 1/4 cup honey. I used regular yeast, not Rapid Rise. Either would probably work, but I haven’t tried with the Rapid Rise product. I serve these with a big bowl of Beef and Barley Soup! Or with a bowl of Pasta with Tomato Cream Sauce! These are the easiest rolls everrrr! Imagine just one rise...yay! Check out the amazing instructions! Preheat oven to 170 degrees. Butter (or line with parchment) a 16 x 11 baking sheet or two regular 9 x 13 cookie sheets. Add 1 1/2 cups hot water (should be very warm to the touch). Add 4 cups of flour and the yeast - mix for about 1 minute. Add another 4 cups of flour, one at a time. Add additional flour if needed until dough just separates from the bowl. Using Kitchen Aid or your hands, knead for 5 minutes until silky smooth in texture. Line a large sheet pan (or two cookie sheet pans) with parchment paper. 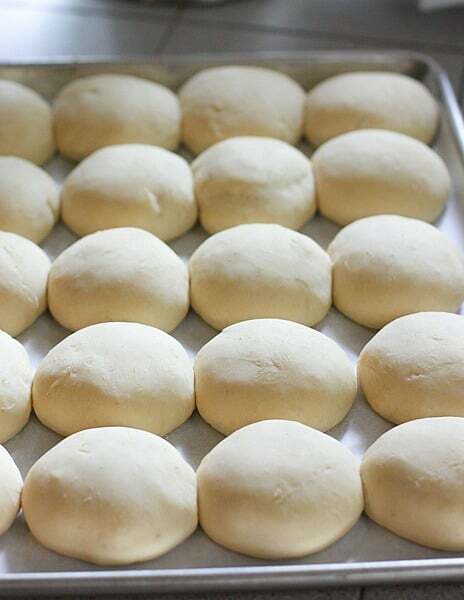 Shape dough into approximately 3.5 once rolls and place on prepared sheet pan(s). Leaving the rolls in the oven, Turn up oven temperature to 350 degrees. Bake for about 20-25 minutes or until lightly brown. Top with melted butter and coarse salt if desired. I made dinner rolls twice with your recipe. It is a perfect recipe. Both times, it worked out perfectly well. If you can, please give the measures in metric. Thank you. Would a 10X15 pan work? Hi Judy, yes that would work great! I updated the recipe with pan size…thank you so very much for your note! I made these for a church dinner tomorrow. We’ll see if they like them! I love this because it is only 75 mins. I really want to print it but unfortunately when I try, the PRINT turns to a PIN IT. I already pinned it. Oh, well. Hi Janiece – Not sure what the problem is. I just printed a copy with no problem. I think you may be hovering over the photo and engaging the pin button? So sorry! Well I decided to make the large batch it yielded 30 rolls. My 8 yr old granddaughter helped make them it was a great experience for her. Plus she can brag tomorrow when everyone’s eating them. These were very easy to make and taste and smell delicious. Your note made me soooo happy! I love that you cook with your grand daughter, and am so glad you loved my recipe! Smiling all day!!! Happy Thanksgiving! I absolutely love homemade rolls. These look so easy, perfect for the holidays! And I also love the smell of fresh bread, yum! 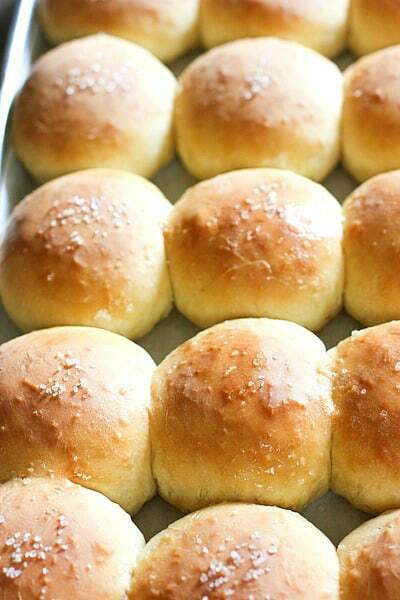 I am loving these rolls – seriously! They are gorgeous and I love the method — so easy. I’m in charge of the rolls this Thanksgiving…. I think I know what I’m making! You must be clairvoyant! I was just thinking, not 15 minutes ago, that I should make rolls for Thanksgiving! These look delicious nad I love the idea that they are fool proof and so easy to make. Soft, delectable bread pillows. I wonder how these would taste using buttermilk? I have some in the fridge I need to use up. Thanks for this one! Thanks Kevin! I love buttermilk in all things! Not sure how it would work, but how can it be bad?